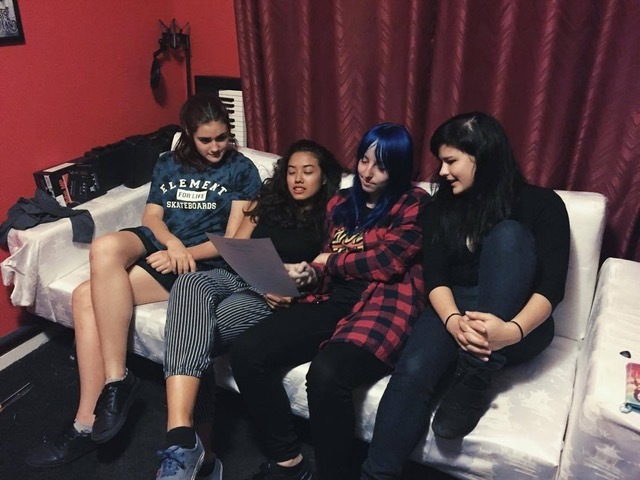 Chasing Velvet is a new all girl band from Brisbane, Australia. 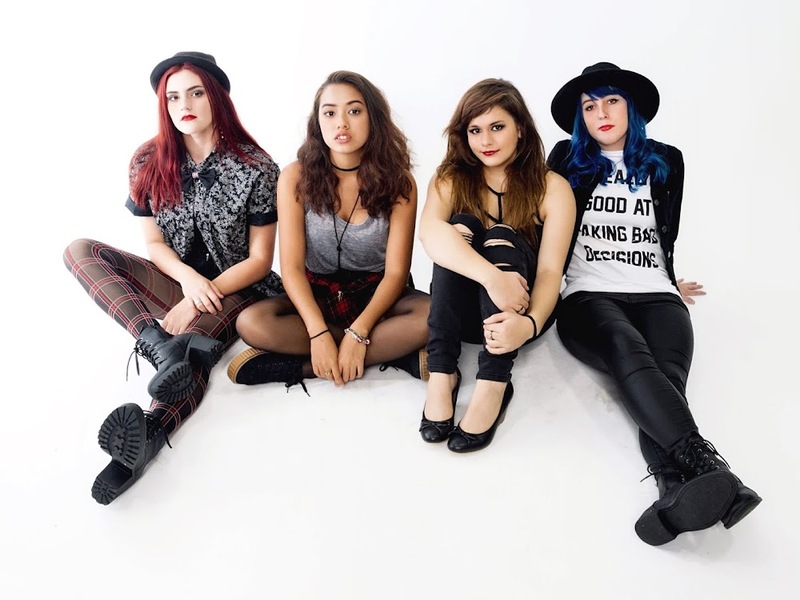 Following their entry into the industry, the girls have released their first ever single, Vertigo. 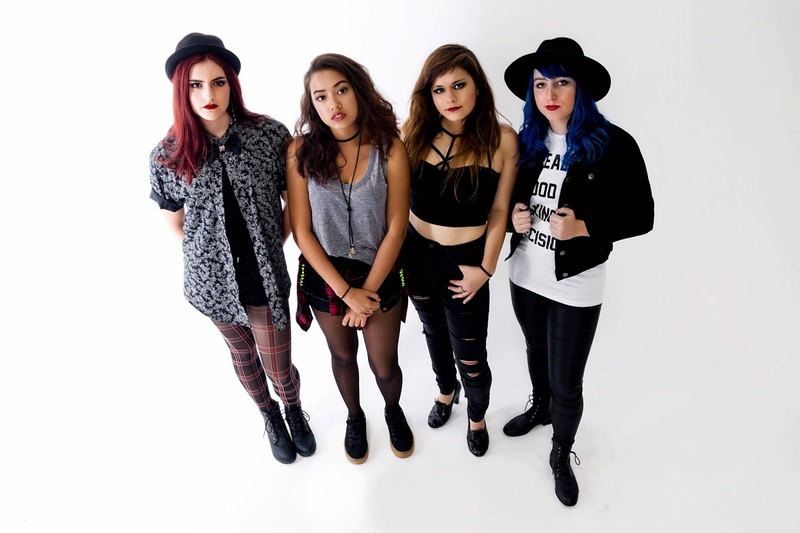 Amira (far left) takes centre stage with the vocals, Luci (far right) rocks it on guitar, Jaslyn (inner right) creates depth on bass and Naomi (inner left) kills it on the drums. These girls are undoubtedly amazing. I think Chasing Velvet has major potential in the music industry with their energetic pop-rock style. 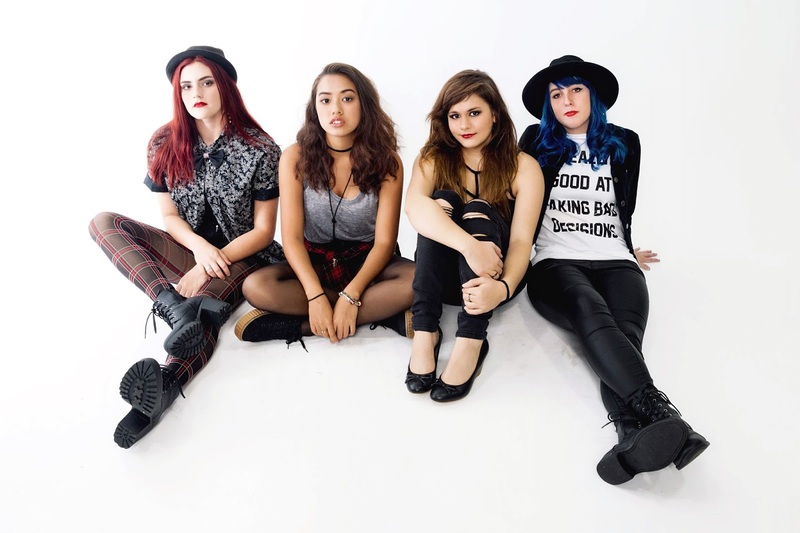 Since they're relatively new, I have set up an interview with the girls so you can learn more about the band and their personalities. Could you please do a quick introduction of yourselves and what you play in the band? 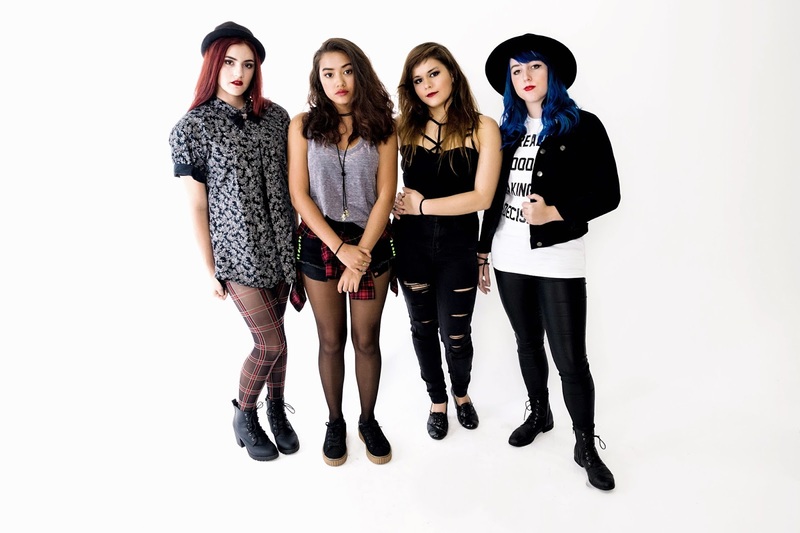 Amira: I'm Amira and I sing, Luci plays guitar, Jaslyn is on the bass and Naomi is our drummer. Since you’re a relatively new band, how are you finding the music industry so far? Luci: Overall everybody has been very supportive of us and our new single, Vertigo, we haven’t really had any negativity so far which is great. I guess only time will tell how the world receives us and our music! How did the name Chasing Velvet come about? Jaslyn: Well when we were brainstorming band names, Luci really wanted the word Chasing & Jaslyn wanted the word Velvet, and that’s how the band name came about. What made you decide that you wanted to pursue a career in music? Jaslyn: I grew up with music and its always been something I loved. I’d always be singing with my sister either Singstar on PS2 or real life, and always playing Guitar Hero with all my siblings, then in school, I got very into the real instruments (although I was too shy to show off). Luci: Music has always been a big part of my life and I have grown up playing instruments and singing and I always knew it would play a role in my future career and life. Naomi: Ever since I can remember is was playing music or dancing to music. I started playing percussive instruments in church with my sisters then it kind of just expanded to drums and acoustic guitar and that made me want to perform & playing music for the rest of my life. Amira: I started singing and performing in school musicals but always dreamed of joining a band because I'd watch my favourite artists perform live and it looked like so much fun. Luci: There are way too many to list, but 5SOS, Hey Violet, Twenty One Pilots, Paramore to name a few. We all come from different musical backgrounds so it’s really cool that we all bring our own influences into the band to create what we do. You’ve recently announced that you have a new single out, Vertigo, can we expect a music video anytime soon? Naomi: Probably not for this song, but we are working on new music right now so certainly in the near future! What is your favourite line in your new single and why? Amira: It would have to be the pre-chorus line of “I just feel lovesick, sick of this, waking up again and again”, because it’s about the struggles associated with a relationship and being stuck in a loop and not being able to come to terms with what’s happening. I think a lot of people can relate to that. What can we expect from Chasing Velvet in the future? Naomi: We are working on new music right now in the studio, so we are really excited to share with you something new real soon. Also later in the year we will no doubt be touring, so it will be great to meet everyone and see some new faces! Could each of you describe another member in the band in less than 5 words? Would you rather go out and party on a Friday night or stay in on the sofa? Jaslyn: Not particularly a rave party, but I'd prefer to go out and just chill with friends and meet new people, sure. Amira: If the party involves a live band, count me in! Naomi: Honestly depends on how I’m feeling, a fun night out with buddies (not so much partying) or a chilled night at home binge watching is always good. Luci: Stay in, watching Netflix and eat pizza. What is each of your favourite movies? Naomi: The Perks of Being a Wallflower. It’s one of those movies where a whole different range of people can relate to & it’s just too good. Jaslyn: Beautiful Creatures as it's very intriguing, mysterious, magical as well as having a massive plot twist to prove love is more powerful than anything else, and that’s what I believe in. Luci: The Day After Tomorrow. It’s been my favourite movie ever since I was 5. Naomi: John Mayer – he’s so old and Prince cause he’s just legendary. Luci: Harry Styles, his curls are beautiful and we are birthday twins. Jaslyn: I absolutely love Youtuber, Cristopher Ofling. I love his weird, outgoing and random nature. Who would you love to support on tour? Luci: Probably 5SOS & Twnety One Pilots. Jaslyn: For me, this one has to be The Script! Amira: Definitely Twenty One Pilot’s or Paramore. Naomi: That’s a bit tricky to answer but I’ll go with Twenty One Pilots or Coldplay. Amira: We want to thank everyone so much for all the kind words and positive support! We have only been a band for a short time and the response has been amazing, thank you! It is also available to listen to on Spotify.